There is nothing that you can do to help it, really, at this point. 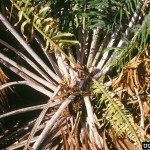 Removing all of the fronds will usually result in the death of this cycad, unfortunately. Sometimes, as they are dying, they can shoot up a replacement pup or two. Just be patient, and you might see a replacement soon. If not, then the plant has suffered irreparable damage due to the negligent pruning.